Choose your favorite color or hue – if you have loved a certain color all your life, then go with that color or a shade close to that. If you are still unsure, look at your wardrobe and the color that appears most in your clothes or shoes — if that does not help, make a color board with pictures of your favorite things and see what colors tend to present themselves. Don’t forget to take into account your surrounding or event facility where you are holding your wedding/reception. This can also play a large role in determining a color scheme as some colors may clash with the surroundings where you will be hosting your event. Remember to think of the colors of your favorite flower so that it can be used in your color scheme. This will also help to possibly determine a color palate and maybe even a time of the year to be married. The colors you use can also be altered somewhat with regards to what flowers are in bloom during each season. If you order flowers out of season, it can also really run your cost up in the end. 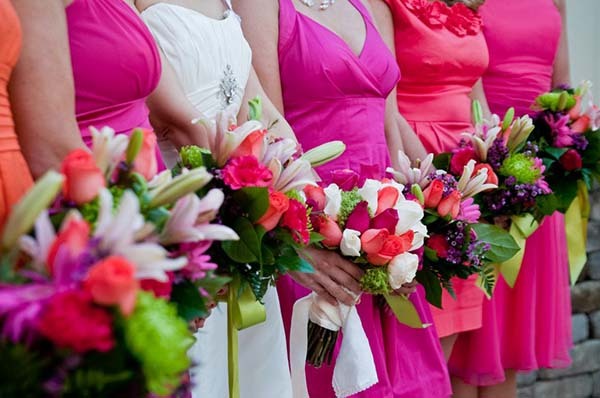 Think of the bridesmaids dresses and how these colors are going to impact the dress and décor. First, finding a dress that everyone agrees on can be difficult and then, sometimes, it can only come in certain colors – all of which can impact a color palate. Finally, take care in using the colors you have chosen. Simple color schemes that are used wisely can more of a statement than using the colors too much and in too many places. Sometimes, less is more. Always remember to go with your gut feelings when looking at colors and something that is easier to work with when decorating. Don’t forget to contact us to see how we can incorporate your colors into the neutral palate of our wedding/event facility.